Apollo 8 Astronauts Lovell, Borman and Anders made our 1968 Christmas very exciting by getting to the USA to the moon and back. These fine men were yesterday’s pioneers leading us to today’s unmanned explorations to Mars and beyond. The mission was to scope out the best landing spot for the next Apollo mission. I wonder how many paper manuals were on that spaceship. In 1968, I was 14 and my parents never imagined seeing or hearing live TV broadcasts from the moon on those black and white TVs with antenna ears. These Astronauts were honored by Time Magazine as “Men of the Year”, since they accomplished such wonderful things such as returning to the earth all intact. My inspiration came from their manuals, the many pages and diagrams to reference while in space. Having no word search function, I imagine out of the three of them they knew section and chapter where the information could be found. The other amazing thing is how one can manipulate yesterday’s photos with today’s technology. Using the Apollo 8 manual, I made a collage, took a picture and had fabric made. 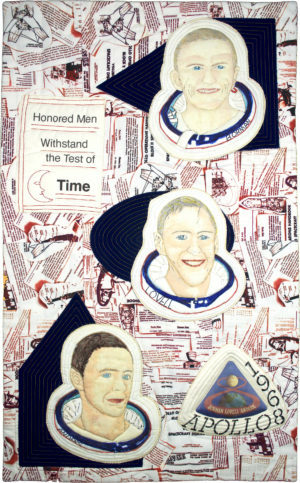 The portraits were done by using a NASA photo, converting it to a sketch and bring it back to life in fabric. The paper sketch was colored and transferred to fabric where additional details were added. The quilting layout was designed and quilted by my co-designer Olga Schrichte. The military gold adds the American touch to these Time Honored Men. Photo manipulation, Copic Markers on paper for facial tones, photo fabric, fabric portrait touch-up with ink. raw edge applique machine quilting, designed fabric. Photo fabric, custom fabric printed using a collage made from the Apollo 8 manual, pieced base.